A Few Good Men is a play by Aaron Sorkin, first produced on Broadway by David Brown in 1989. It tells the story of military lawyers at a court-martial who uncover a high-level conspiracy in the course of defending their clients, two United States Marines accused of murder. General court-martial in Washington, D.C. It opened on Broadway at the Music Box Theatre in New York on November 15, 1989, in a production directed by Don Scardino, with Tom Hulce as LTJG Kaffee, Megan Gallagher as LCDR Joanne Galloway and Stephen Lang as Col Jessep. Michael O'Hare replaced Lang as Jessep later in the run. 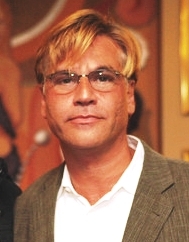 Sorkin adapted his work into a screenplay for the 1992 film of the same name. The play takes place after the death of US Marine Private Santiago as the result from an ill-advised informal punishment labelled a "Code Red" at a US naval base in Guantánamo Bay. Private Downey and Lance Corporal Dawson are the two Marines put on trial for the murder of Santiago. The two men are assigned a lawyer, US Navy Lieutenant Daniel Kaffee. Kaffee is an unmotivated lawyer who goes into his cases looking for a plea bargain and the shortest sentence. It seems to be following that exact path until US Navy Lieutenant Commander Jo Galloway makes an appearance in Guantanamo Bay. Kaffee and Galloway do not see eye to eye as she believes this is a serious case of misconduct while Kaffee can not be bothered with it. He even goes as far as trying to drop the case. The two men are being put on trial because Santiago had reported he had seen a guard illegally fire his gun at night while off the base. This was Santiago's way out as he up to that point had been a lackluster Marine and had fallen behind too much. It seemed to be a clear-cut case of two men trying to cover up a mistake and eliminate a loose end. After Galloway finally got to Kaffee they spend much of the play prodding information from both men as they will not give information without a clear question. This all leads up to the climax as Kaffee finally has all the information he needs and goes for the two head men at the camp in Col. Jessep and Kendrick. Kaffee puts Jessep in a corner while implying that Santiago did not have to be moved if Jessep had given the order to not touch him as all his men listen to him. Finally, Jessep explodes with rage and yells "You can't handle the truth!" This leaves the courtroom stunned and Jessep being charged with the murder of Private Santiago and escorted out of the courtroom. But this was not the end as Dawson and Downey were found not guilty of murder but were dishonorably discharged for conduct unbecoming a Marine. LTJG Daniel A. Kaffee - The main lawyer who will defend both Dawson and Downey. He starts as a plea-bargain happy lawyer and with a little help from Joanne Galloway, he develops into a lawyer who is willing to fight for his clients. Pfc. Louden Downey - one of the two men accused of the murder of Santiago. He is the quiet member of the two soldiers and lets Cpl. Dawson do the talking for him. LCDR Joanne Galloway - a hardworking and determined lawyer who finds and brings light to the murder case. Capt. Isaac Whitaker - the commanding officer in Washington. He sends Galloway to Guantanamo Bay. Lt. Jack Ross - the lawyer who oversees prosecuting Dawson and Downey. Capt. Matthew A. Markinson - worked with Jessep and suggested moving Santiago. Lt. Col. Nathan R. Jessep - the commanding officer in Guantanamo Bay. He ordered the murder of Private Santiago. LCpl. Harold W. Dawson - one of the two men accused of the murder of Private Santiago. 1Lt Jonathan James Kendrick - Santiago's platoon commander. Sorkin got the idea for the play from a phone conversation with his sister Deborah, who had graduated from Boston University Law School and was serving a three-year stint with the Navy Judge Advocate General's Corps. She was going to Guantanamo Bay Naval Base to defend a group of Marines who had come close to killing a fellow Marine in a hazing ordered by a superior officer. Sorkin took that information and wrote much of his story on cocktail napkins during the first act of the musical La Cage aux Folles while bartending at the Palace Theatre on Broadway. Several former Navy JAG lawyers have been proposed as the model for the character of Lieutenant Daniel Kaffee, USN, JAG Corps. These include Donald Marcari, David Iglesias, and Walter Bansley III. The court martial was Macari's first big court case. However, in a statement released by his spokeswoman, Sorkin said, "The character of Dan Kaffee in A Few Good Men is entirely fictional and was not inspired by any particular individual." Once Sorkin completed a draft, his theatrical agent sent it to producer David Brown who wanted the film rights. Sorkin sold Brown the rights, getting Brown to agree to also produce A Few Good Men as a play. A Few Good Men had its world premiere at the Heritage Repertory Theatre at the University of Virginia's Department of Drama on September 19, 1989. It then transferred to the Kennedy Center. The original Broadway stage production opened at the Music Box Theatre in New York on November 15, 1989, in a production directed by Don Scardino, designed by Ben Edwards, and with music by John Gromada. It starred Tom Hulce as LTJG Kaffee; Megan Gallagher as LCDR JoAnne Galloway; Clark Gregg as Lt. Jack Ross; Stephen Lang as Col Jessep, and Robert Hogan as Capt. Matthew A. Markinson. Replacement actors included Timothy Busfield and Bradley Whitford as Lt. Jack Ross (understudy for Kaffee), Perry King, Michael O'Hare, and Ron Perlman as Jessep, and Pamela Blair as Galloway. Joshua Malina also appeared. Malina went on to reprise his role in the movie adaption. The production ran for 497 performances. A Spanish-language production titled Hombres de Honor opened on January 10, 1991, at the Ferré Performing Arts Center in Puerto Rico, starring Cordelia González and Rafo Muñiz, directed by Pablo Cabrera. A national touring company performed through 1992 with Michael O'Keefe as LTJG Kaffee, Alyson Reed as LCDR Galloway, and Paul Winfield as the judge. In January 1993 A Few Good Men had its premiere in German language at the Volkstheater, Vienna, Austria (translation: Gunther Baumann, director: Erhard Pauer, Daniel Kaffee: Alfons Haider). In the following years this production went on tour and was shown all over Germany, Switzerland and Austria (German title: Eine Frage der Ehre/A Question of Honor). A revival of the play starring Rob Lowe in the role of LTJG Kaffee, Suranne Jones as LCDR Galloway and John Barrowman as Capt Ross, opened at the Theatre Royal Haymarket, London, in late August 2005 for preview showings followed by a three-month run in early September 2005. The stage show was directed by David Esbjornson. In 2006, the Hudson Shakespeare Company of New Jersey staged a production as part of their second stage for modern shows. The tour was presented in city courtrooms, directed by Jon Ciccarelli and featured notable NYC actors such as Jon Crefeld as LTJG Kaffee and Charles J. Roby as Col. Jessup. Jensen Ackles appeared as LTJG Kaffee alongside Lou Diamond Phillips as Col Jessep in a production of the play at the Casa Mañana Theatre, in Fort Worth, Texas, June 5–10, 2007. It has also been performed in London, Oxford and Portsmouth by amateur groups. A Hungarian production of the play was performed at Madách Szinház, Budapest. It was directed by Imre Kerényi, starring Sándor Czvetkó, Éva Kerekes and Gábor Koncz. By the Book Theatre produced the play November 25, 2014 to December 6, 2014 at the McManus Studio Theatre, London, Ontario. The production won 4 Brickenden Awards including Outstanding Drama. June 30, 2016 marked the opening of the Warehouse Studio Theatre production at The Noho Arts Center under the direction of Tony Pauletto and starring K. C. Clyde as Kaffee alongside Dennis LaValle as Jessup and Sarah Klein as Galloway. In March 2016, NBC announced its intent to broadcast a live television production of A Few Good Men, starring Alec Baldwin as Col. Jessup, in the second quarter of 2018, with a teleplay adapted by Sorkin from his original script. The broadcast would be executive produced by Craig Zadan and Neil Meron, and patterned upon NBC's ongoing series of live Broadway musicals. However, NBC has yet to announce an airdate. Variety reported that the availability of Sorkin, Zadan, and Meron may have had an impact, noting that Sorkin had to represent his 2017 film Molly's Game during awards season, while Zadan and Meron (who have produced all of NBC's live musicals) were committed to other projects (such as Jesus Christ Superstar Live in Concert in 2018, and a later cancelled production of Hair in 2019) being produced by NBC in lieu of Bye Bye Birdie, which has been delayed multiple times in order to accommodate Jennifer Lopez's other projects. The Broadway production earned Megan Gallagher a 1990 Theatre World Award and a Best Actor nomination for Tom Hulce at the 44th Tony Awards. The play is based on events that took place at Guantanamo Bay Naval Base in July 1986, though various details were changed for dramatic purposes. Members of Rifle Security Company, Windward Side, 2nd Platoon believed that one of their number, Pfc. William Alvarado, was a malingerer and had informed about a Marine firing across the border into Cuba. In a retaliatory hazing (called a "Code Red"), ten Marines seized Alvarado, blindfolded him, stuffed a rag in his mouth, beat him and shaved his head. Alvarado was seriously injured, but did not die. Of the ten Marines, seven accepted other than honorable discharges as part of a plea bargain, but three, including David Cox, refused to accept the plea bargain and went to court. Cox was defended by Don Macari. Cox was found not guilty of aggravated battery, but guilty of the misdemeanor charge of simple assault. He was sentenced to time already served in the brig, and returned to active duty. Cox was honorably discharged from the Marines in 1989. When he saw the film version of A Few Good Men, he was upset at the liberties taken with the event, most notably that the Marines in the case were dishonorably discharged, and considered suing the filmmakers. Cox disappeared in 1994. He was found murdered, along a riverbank near Medfield, Massachusetts. ^ "4 Lawyers Claim to be the hero in A Few Good Men," New York Times. 9.16.2011. ^ "A Few Good Men London theatre tickets and information". ThisIsTheatre.com. Retrieved 2007-01-22. ^ "Not My Job: We Quiz 'West Wing' Creator Aaron Sorkin On Hot Wings". NPR. Retrieved 3 March 2019. ^ a b c d e f g Glauber, Bill (April 10, 1994). "Ex-Marine who felt 'A Few Good Men' maligned him is mysteriously murdered". Baltimore Sun. Retrieved September 21, 2010. ^ Gisick, Michael (May 10, 2007). "Fired U.S. Attorney David Iglesias embraces the media in his quest for vindication". Albuquerque Tribune. Archived from the original on November 5, 2010. Retrieved September 21, 2010. ^ Glaberson, William (15 September 2011). "A Surplus of A Few Good Men". The New York Times. Retrieved 8 September 2014. ^ League, The Broadway. "A Few Good Men – Broadway Play – Original - IBDB". www.ibdb.com. ^ Gamarekian, Barbara (November 30, 1989). "A Moment of Decision At the Kennedy Center". The New York Times. Retrieved April 23, 2010. ^ "2.01 – 2.02: In the Shadow of Two Gunmen (with Thomas Schlamme, Bradley Whitford, and Michael O'Neill)". The West Wing Weekly. Retrieved 2016-10-10. ^ Kissell, Rick (2016-03-30). "NBC Sets Live Production of Aaron Sorkin's A Few Good Men for 2017". Variety. Retrieved 2018-05-29. ^ "Alec Baldwin to Star in NBC's Live 'A Few Good Men' (Exclusive)". The Hollywood Reporter. Retrieved 2018-05-29. ^ Littleton, Cynthia (2018-03-02). "NBC's Production of Bye Bye Birdie Live With Jennifer Lopez Pushed Again (EXCLUSIVE)". Variety. Retrieved 2018-05-29.